The Bird Language Apprenticeship provides the opportunity to study birding and bird language interpretation on an on-going basis with experienced Alderleaf staff. Learn how to understand bird communication to find other animals hidden on the landscape. Through monthly field trips, bird study activities, and support for individual research, students improve their birding skills and understanding of bird behaviors. 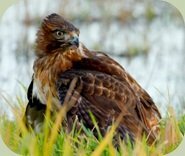 Monthly field excursions to a variety of habitats in Washington State to study birds and their relationship to other animals and the surrounding environment. Engaging in various bird language exercises including interpreting kill sites, identifying feathers, and bird observation activities. Support for and feedback with personal bird study projects between apprenticeship field days. Field time spent listening to and viewing birds, identifying species, and interpreting alarm sequences and animal movements. Improving both auditory and visual bird identification skills of Northwest species in different habitat types throughout the seasons. 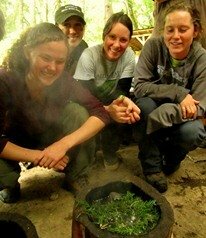 The Bird Language Apprenticeship is kept to a small group so that it can be mobile and personalized. Field locations include forest, coastal, and riparian zones of Western Washington and mountain habitats of the Cascades. Dates: Field days are on the second Sunday of each month, September through June. Location: A variety of sites within Washington State. Enrollment: New enrollments are accepted year-round based on available space. Register for the Bird Language Apprenticeship.